England endured a frustrating day in Antigua as West Indies built an 85-run first-innings lead on day two of the second Test. Kraigg Brathwaite made 49, John Campbell 47 and Shai Hope 41 as West Indies reached 272-6 at the close. Darren Bravo showed the patience needed on a tricky pitch with an unbeaten 33 from 165 deliveries. England, who trail 1-0 in the three-match series, dropped three catches and saw several chances fall just short. West Indies showed a patience that was missing from England’s batsmen, with all but one of the home batsmen reaching double figures. England bowled well and beat the bat on numerous occasions, but they are already facing a tricky third innings on a pitch showing unpredictable bounce. Were England unlucky – or was the fielding to blame? 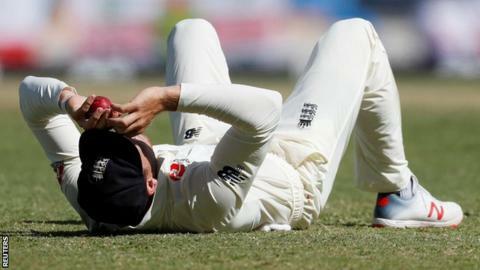 England dropped catches on a day that began with West Indies 30-0 in reply to England’s 187. Jos Buttler dropped two straightforward catches at third slip off Stuart Broad, while Anderson screamed into his cap in annoyance after Rory Burns dropped Shimron Hetmyer at extra cover. John Campbell and Shane Dowrich were both reprieved on review for caught behind and lbw respectively, and there were numerous plays and misses throughout the day. Broad, who was dropped for the opening Test, was left visibly frustrated as the batsmen edged through the slip cordon, but he did reap some rewards in the afternoon session. He claimed two wickets in four balls, Shai Hope edging a cutter behind before Roston Chase was bowled by an unplayable delivery that kept low. However, on a pitch that will only become more difficult to bat on, England could be left to rue their missed opportunities. Only one England batsmen faced more than 100 deliveries – and that was Moeen Ali, batting at seven. Three of the West Indies’ top four bettered that as they occupied the crease, wearing down the England bowlers with patient play. Campbell and Brathwaite’s 70-run partnership – at 200 balls, the longest by a West Indies opening pair against England since 2000 – set the tone, before Campbell was caught at slip off Ben Stokes. Bravo showed extraordinary restraint. He hit only two fours in more than four hours at the crease, and took a nasty blow to the arm from a Broad delivery. He put on 50 with Shane Dowrich before the wicketkeeper was caught at slip off Broad, and shared an unbroken 36-run stand with captain Jason Holder that spanned 19 overs to end the day. Cricket correspondent Jonathan Agnew on the BBC Test Match Special podcast: “England have given their all today but it hasn’t been their day. None of West Indies’ runs have come easily. West Indies batsman Kraigg Brathwaite on Sky Sports: “Those runs were some of the toughest so far in my Test career. Former England captain Alastair Cook on the TMS podcast: “It’s amazing how England haven’t got the wickets. That’s where the credit must go to West Indies – for the determination to stick in. England bowler Stuart Broad on Sky Sports: “We’ve given it absolutely everything. Everyone can hold their head up really high in the changing room. “We need to be the team bowling on day four. Anything can happen. We know we’re a good team when the pressure’s on. Previous articleWhy is Europe against changing the Brexit agreement?